Thank you for visiting our site! We are a family-owned, full service electronics and appliance repair center, with a focus on excellence and Gold Standard Service. We fix things! 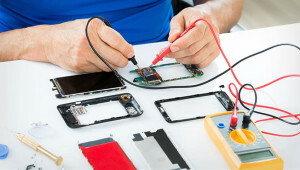 We specialize in TV repair, television repair, projection TV repair, big screen TV repair, HDTV repair, plasma TV repair, LCD TV repair, LED TV repair, stereo repair, projector repair, digital piano repair, keyboard repair, computer repair..
How much will it cost to fix my (x) ? Do you fix (x) ? A. We can fix almost anything! There are a few oddball items or occasional situations where parts are no longer available. In other instances, after diagnostics and our parts sourcing, we occasionally find parts are available, but only at high cost, which obviously impacts the repair price we’re able to quote. However these eventualities are relatively rare and we are overwhelmingly successful in getting our main-claim-to-fame stuff fixed: TV’s, home and pro stereo and audio, projectors, and appliances. We also do many other one-off repairs on other items: massage chairs, inflatable Santa’s, illuminating-and-levitating Halloween ghosts, slot machines, pinball machines, boutique coffee and expresso machines, industrial electronics, warp drives, and the like. A. We have found that in our industry it is not feasible to quote based on a flat hourly rate. We quote based on a “3D matrix” of factors, including class of technician required to finalize the repair (apprentice/journeyman/master), product class, any parts required (not generally knowable in advance of diagnostics and specific sourcing per repair ticket), and of course projected time-to-finalize. Our goal is to develop a quote you will approve. Here is a conceptual diagram illustrating our approach to repair quoting and estimation. Why is it taking so long to complete my repair?
. Generally the only reason a repair might drag on is due to parts delays and back orders, and you should be informed about such circumstances relatively early in the repair process. We have a process in place to perform regular checks with our vendors on such repair tickets. Also, demand curves here are unpredictable and variable and this can sometimes impact expected repair times. We’re working constantly to be proactive and improve our communications with customers about both expected and unexpected delays. Do you buy broken TV’s? In general, no. If it’s a modern flat screen and you have broken the display panel or cracked the screen, and the set powers up, we may offer $5 or $10 for it. Need repair service, or a quote on a custom home theater or Smart Home? How we repaired a 50” Visio TV recently. How we fixed a classic Egnater tube amplifier, beloved by the client. One of our specialties is repair of reel-to-reel tape decks. Another specialty of ours is repair of vintage console stereos. Dean, I just wanted to thank you, and the technician who did the work on my Carver CD Player. It sounds great and is functioning perfectly. Please extend my gratitude and appreciation to all of those involved with this repair/refurbishment. Bammel fixed my nearly unfixable Numark V7. Another repair service (elsewhere) couldn’t fix it. I am happy with Bammel’s service and would recommend them. 5 stars. I brought my Sony 3D HDTV to Bammel TV. The cost was very reasonable. I am very happy with this service and would definitely recommend my friends to this shop. We fix things! We specialize in TV repair, television repair, projection TV repair, big screen TV repair, HDTV repair, plasma TV repair, LCD TV repair, LED TV repair, stereo repair, projector repair, digital piano repair, keyboard repair, computer repair.